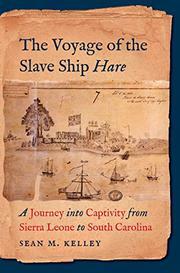 A history of how captives purchased in Africa for transport on the slave ship Hare managed to maintain a community after being sold into slavery. What information is available pertains to the Newport, Rhode Island, ship owned by the brothers Samuel and William Vernon and captained by Caleb Godfrey. Rhode Island was the slave-trading capital of British America, and the selling of slaves was Newport’s primary economic activity. No logbook survives of this voyage, from 1754 to 1755, and Kelley (History/Univ. of Essex; Los Brazos de Dios: A Plantation Society in the Texas Borderlands, 1821-1865, 2010, etc.) had to piece together information based on similar voyages. He admits that he could never identify the captives either by name or birthplace, since much of what we know comes from the nonenslaved. Kelley chronicles their fates from the viewpoints of the ship’s master, those in Africa who provided the captives, and those who eventually sold them in South Carolina. Godfrey sailed to what was called Upper Guinea and procured his cargo, not from a single purveyor but from private traders up and down the coast. Although slaves were taken from different villages, many shared knowledge of the broad group of Mande languages, which gave them at least a sense of community. After buying a few dozen slaves, the Hare crossed to Barbados in only 20 days and then to Charles Town, where the slaves were sold, either by auction or by “scramble,” where buyers just grabbed those they wanted. The most interesting part of the book is the author’s discussion of the attempts—and successes—by these slaves, either in plantations or the city, to stay in contact with their shipmates and with those who spoke Mande. An important book that not only shows how the slave trade operated, but also provides a clearer picture of the victims’ origins, language, and methods of survival.